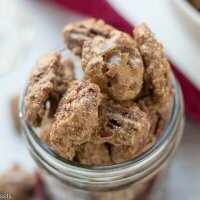 Hi Everyone, these candied pecans are so easy to make and so delicious! 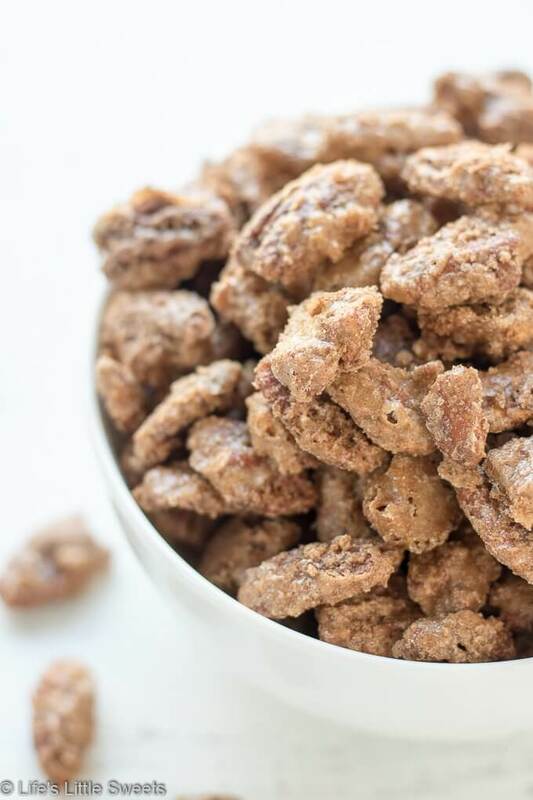 They are a perfect addition to the holiday table being a salty-sweet snack which appeals to so many people. They are perfect for gift giving too be it for a hostess gift or holiday gift. 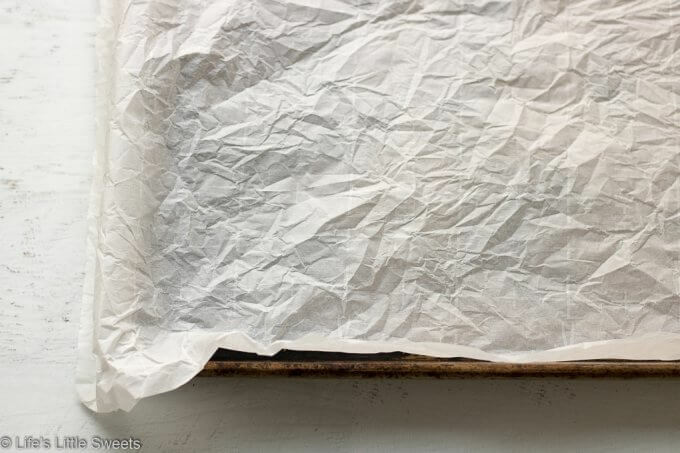 All you need are some lidded mason jars, some ribbon and perhaps some fabric to add some flair. 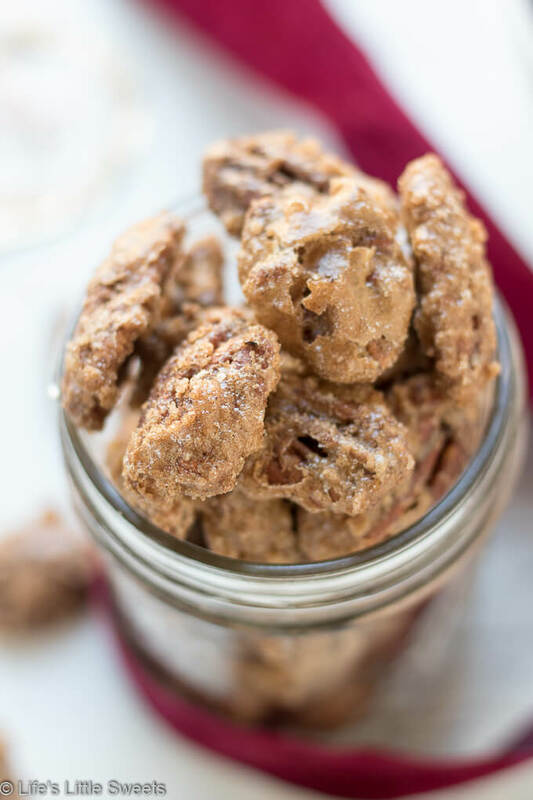 These are also great on a cheese board to serve as appetizer. 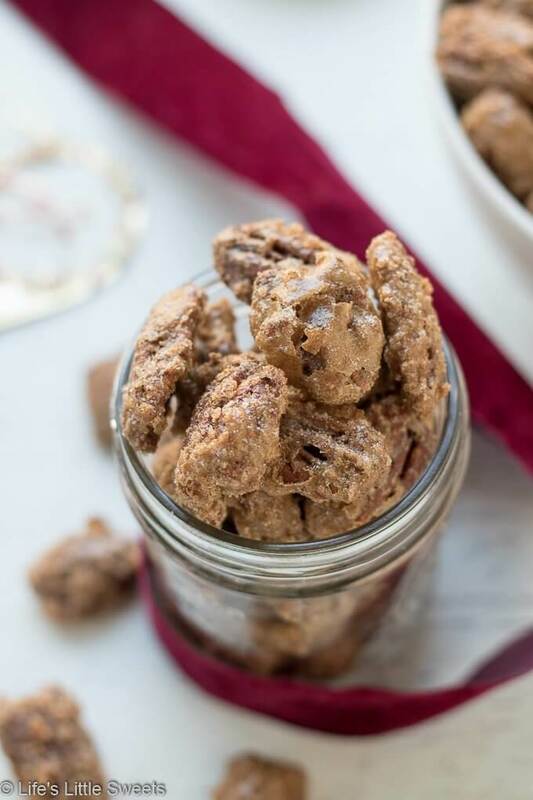 When they are around, I personally, have a hard time resisting them, so much so, that I had to package them up to give away 🙂 Those crispy bits on the outside are heaven…. 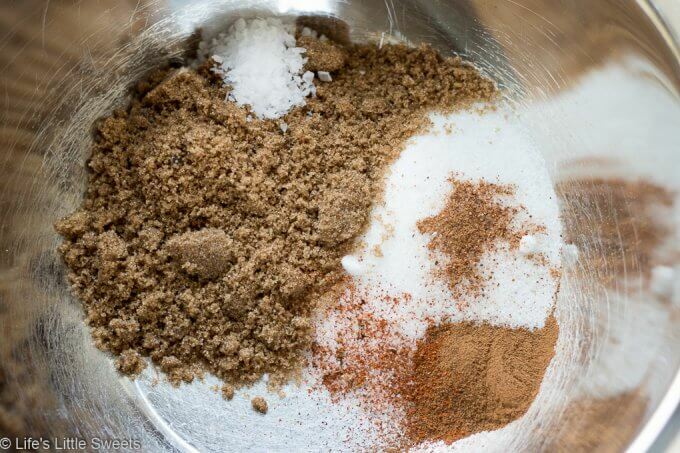 In a large mixing bowl, add both sugars, cinnamon, salt, nutmeg and Harissa seasoning. Combine evenly. 4. 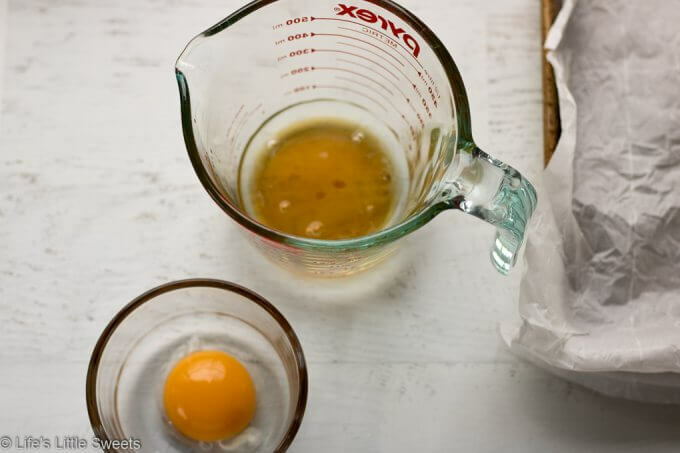 In a separate large bowl, mix egg white, vanilla extract and water together. 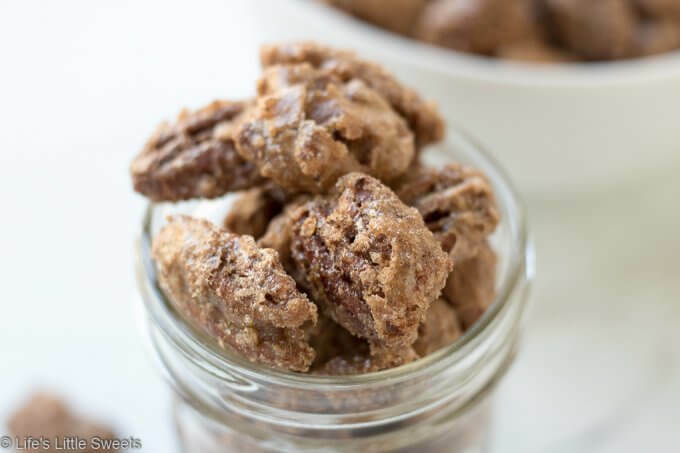 Add the halved pecans to the egg white mixture and coat completely. 7. 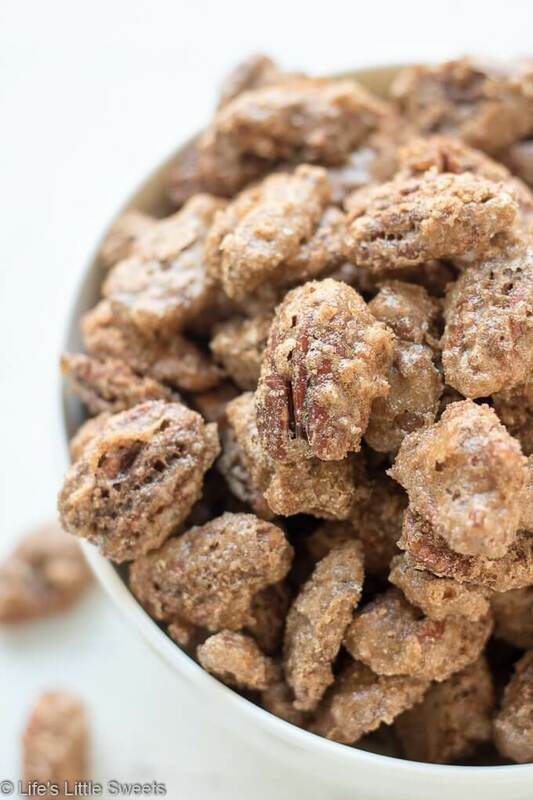 Sprinkle the sugar-spice mixture over the coated pecans and use a fork to toss until the pecans are coated completely. 8. 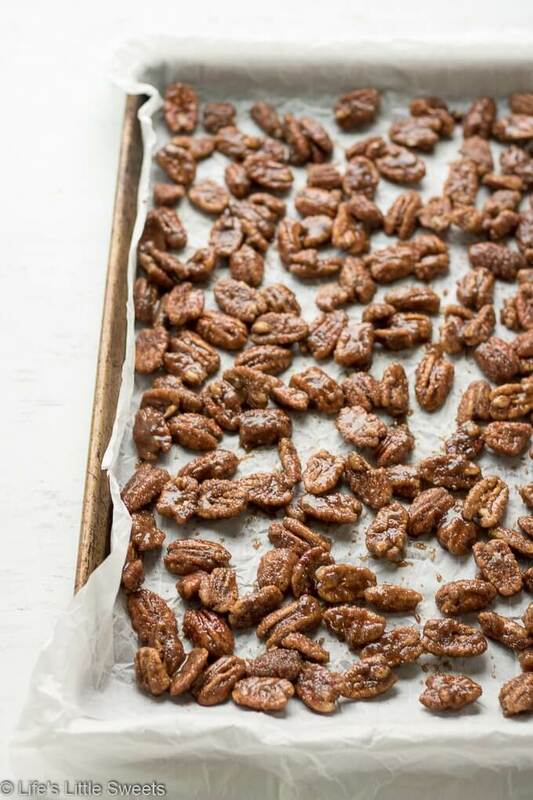 Spread the pecans on the prepared baking sheet. 9. Bake in a 250 degree F oven for 1 hour until evenly cooked and browned. 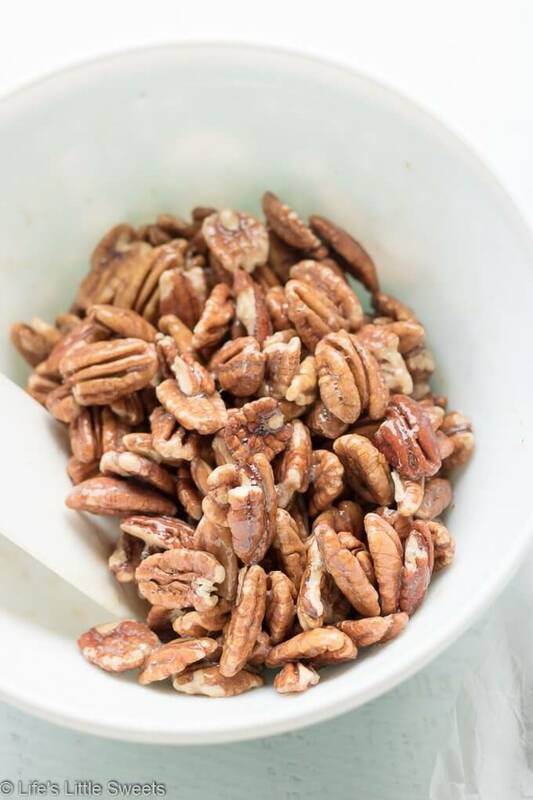 Every 15-20 minutes toss the pecans so they bake evenly. 13. When they are done, allow to cool thoroughly. Optionally, package in lidded mason jars. Enjoy! 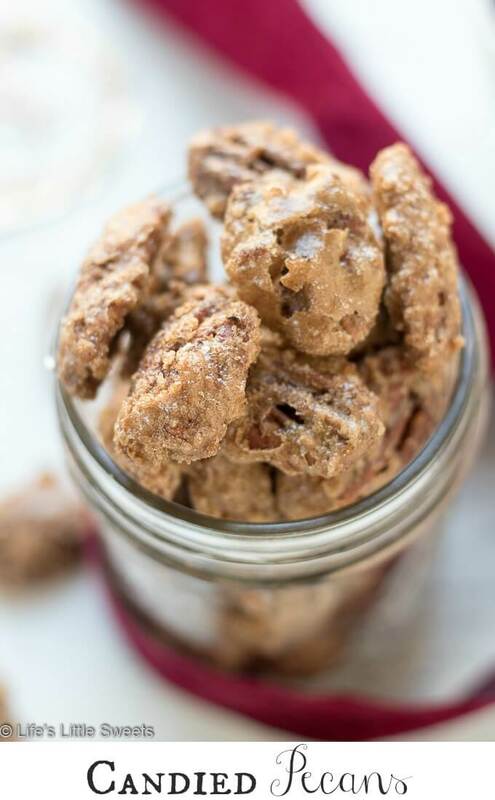 If you make this Candied Pecans recipe, let me know in the comments below! Thank you in advance! 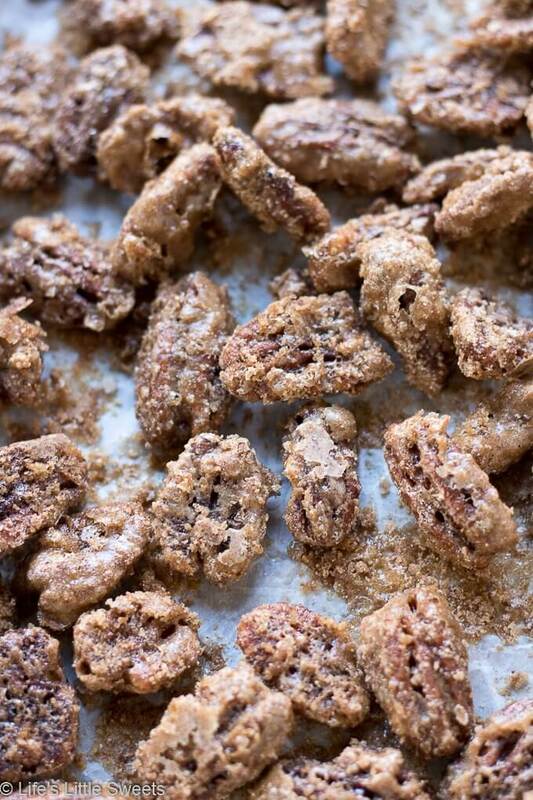 Candied Pecans are a spiced, salty-sweet snack perfect for an edible gift! 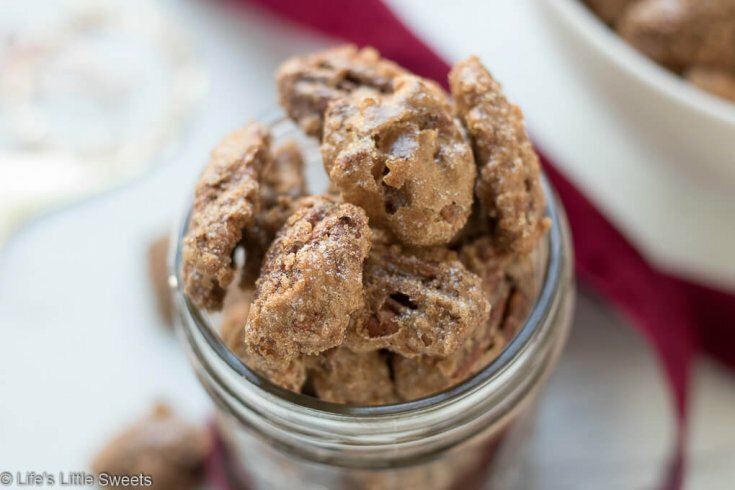 They are easy to make and easily customizable to your tastes. 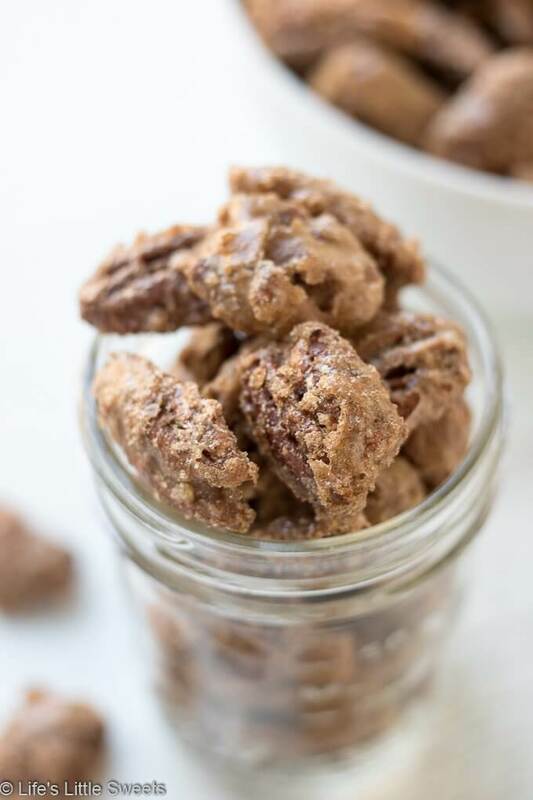 My version has halved pecans, cinnamon, regular and brown sugar, maple syrup, pure vanilla extract, a little bit of ground nutmeg and Harissa seasoning. 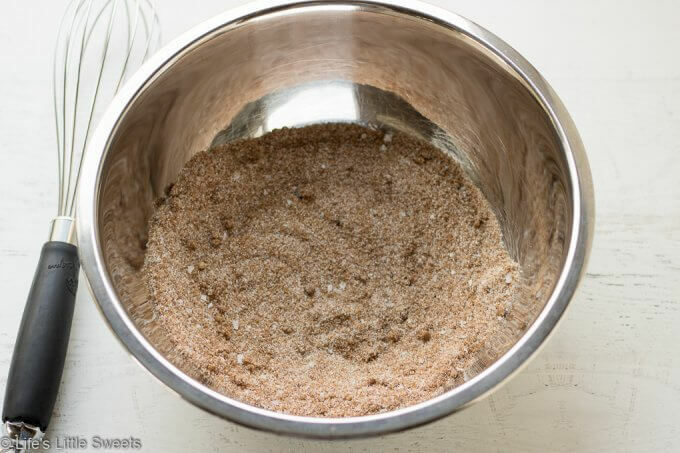 In a separate large bowl, mix egg white, vanilla extract and water together. 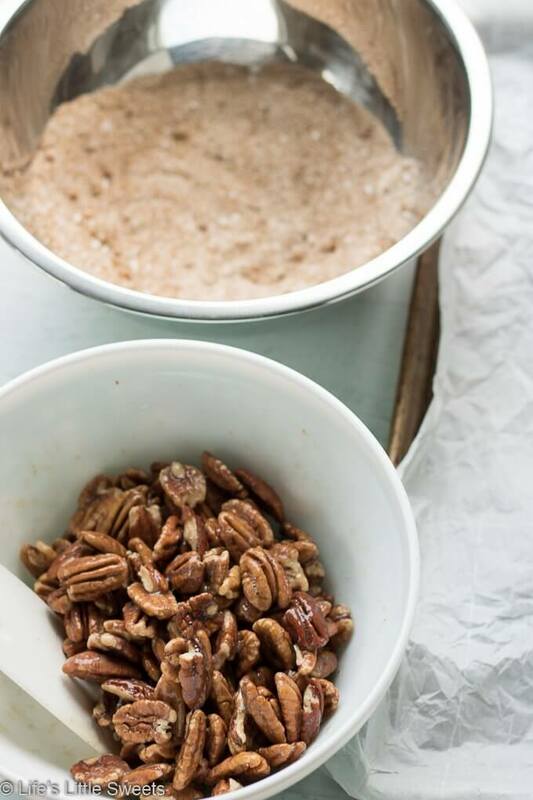 Add the halved pecans to the egg white mixture and coat completely. 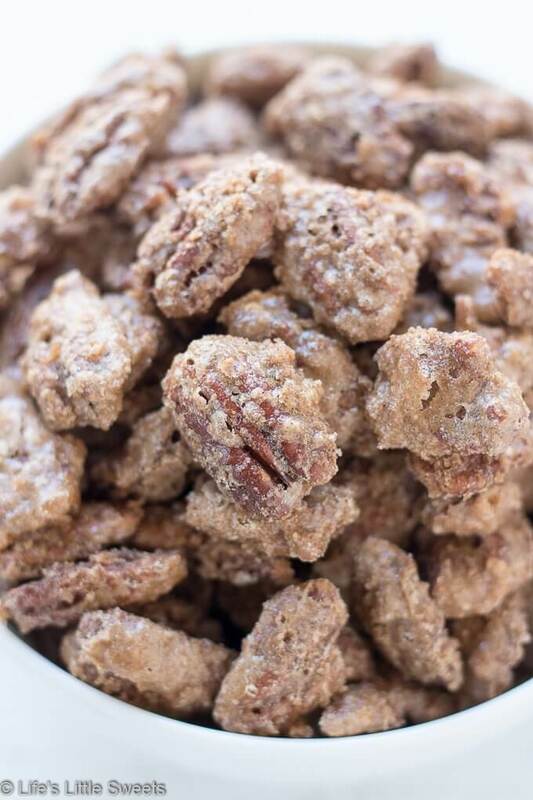 Sprinkle the sugar-spice mixture over the coated pecans and use a fork to toss until the pecans are coated completely. 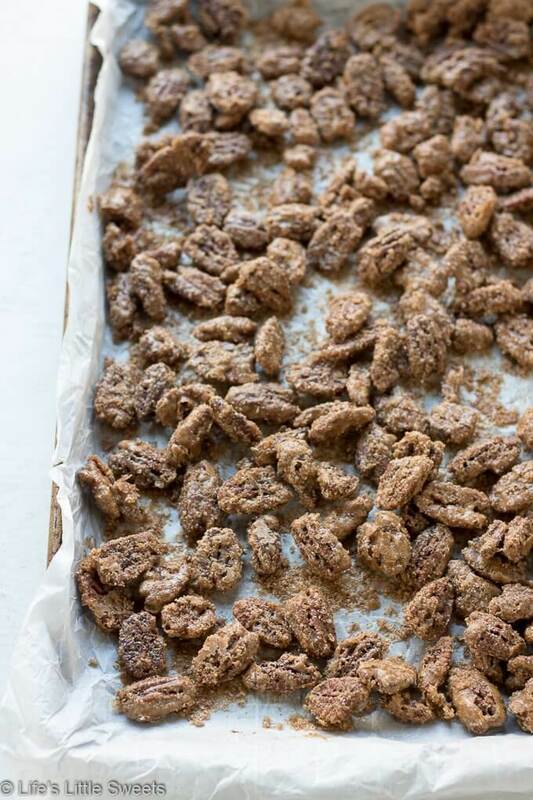 Spread the pecans on the prepared baking sheet. Bake in a 250 degree F oven for 1 hour until evenly cooked and browned. 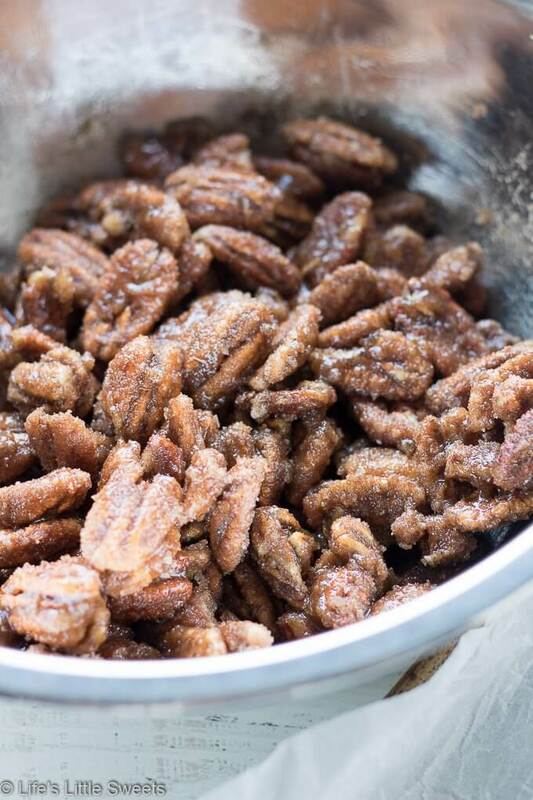 Every 15-20 minutes toss the pecans so they bake evenly. When they are done, allow to cool thoroughly. Optionally, package in lidded mason jars. Enjoy! The calculated nutrition is an estimate at best.